This was an event that we held on Mt. San Jacinto that was my favorite. 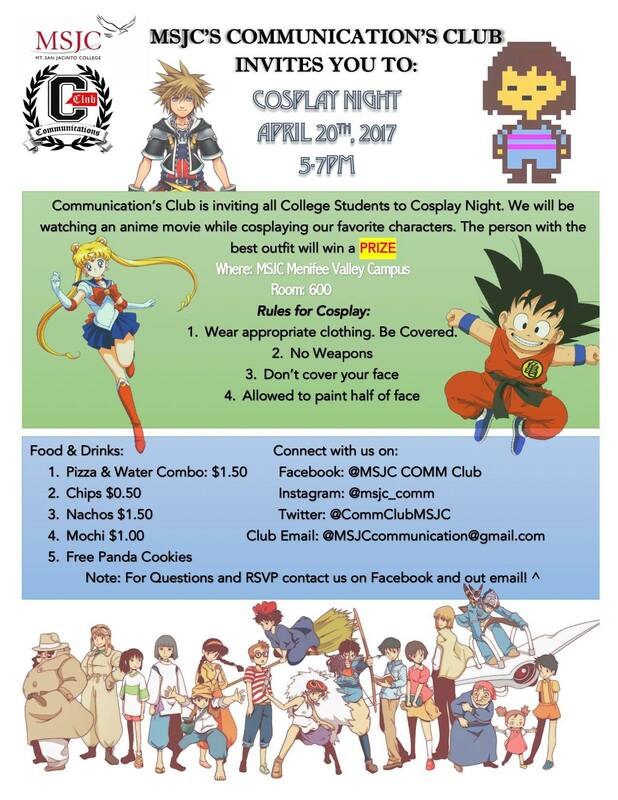 I enjoyed designing this flyer because our event's theme was Cosplay. People were allowed to dress up in certain costumes and we played an Anime Movie. The movie we played was "Howl's Moving Castle" from the famous Hayao Miyazaki. One of the difficulties that affected our group was that a role was not fulfilled and it affected my own role to make the flyer, advertise to people on time, and it also affected the club to push back the event. However, when the event took place, we were pleased that a lot of people came despite our delay to host the event. It had inspired the club to host another Cosplay event and we were all pleased with the teamwork we pulled through. It was my favorite event and I was happy that the audience enjoyed themselves. They said they were looking forward to attending another event like that from the club. © 2019 • All content within this entry is strictly the property of Danielle Bawit, and is not for public use without permission.